I've been extremely busy so I haven't been posting much. 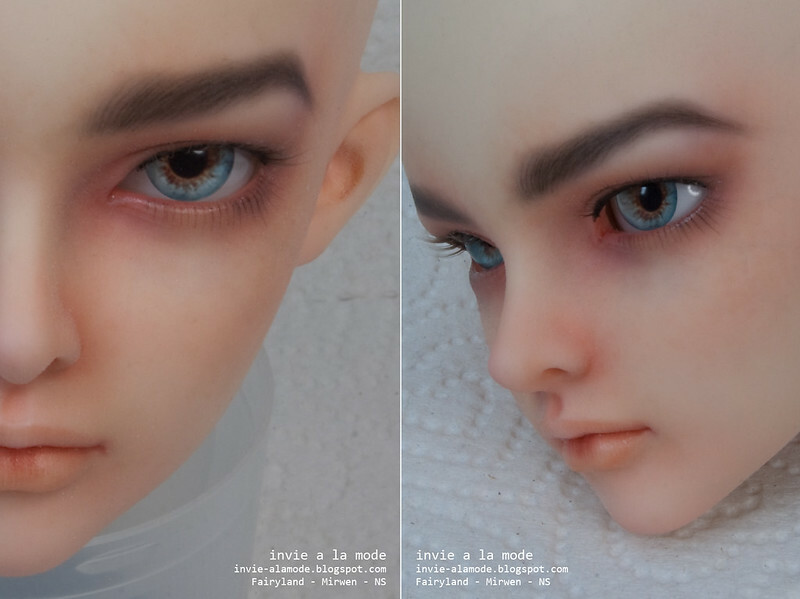 I'm actually on a sleep deficit and my eyes are fuzzy as I write this but I really wanted to talk a little about my latest faceup so forgive me if I ramble incoherently. F60 Mirwen is a huge favorite of favorites from Fairyland and really needs no introduction. The only thing I can say is that I bought her on the normal bust body completely expecting to be smitten but in person the Jury 2012 that came with her stole the body and named herself Anemone. Not too long after Mirwen arrived, my order from the first F60 body event arrived. I had ordered two bodies. A NS Muscular one for a hybrid with my Granado Boyd and a BW Normal body for my only BW Jury 2012 head. (I had fully intended to keep the BW Jury but I can't really justify so many large dolls and Anemone pretty much latched onto my Iplehouse YID Mars so there was no need for another 60cm male doll.) However as doll plans go, the tight stringing in FL bodies deterred me from the hybrid since I would have had to take the neckpiece off and instead I put Mirwen on the muscular body and painted him up. 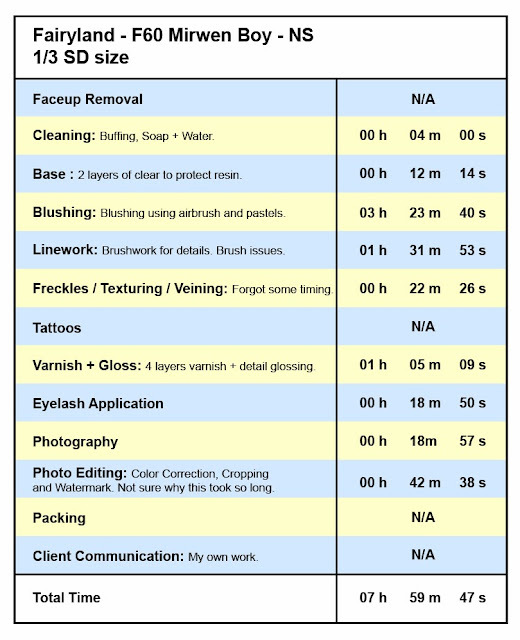 If you take a closer look at the images you will be able to see the detailing in the skin texture. There are small blue veins painted in but the color doesn't show up very well. I think the texturing works very well on slightly more realistic sculpts. Even on less realistic sculpts I think that the dept it creates is very attractive. I would like to try it on more idealized or anime looking sculpts to see how it works out. Here is his time chart. I have no idea why it took so much longer to edit the photos than usual but that's how the timing came out. I would also like to point out that my timing isn't perfect and there are moments I forget to turn the timer on so this isn't the most accurate measurement but it gives you an idea of the median time range. A few more shots so you can drool lol....I love the sculpt in photos but in person I don't feel attached at all. 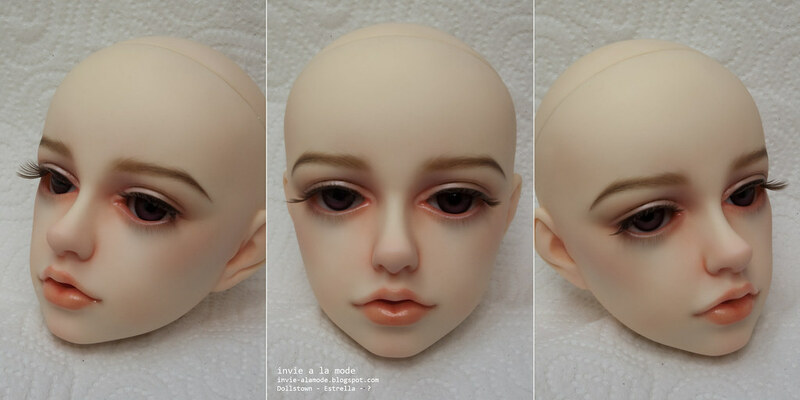 Oh, and the new owner requested an eye opening and a similar faceup on the sleep head so stay tuned! I'm sorry to have to say that I will be too busy to take commissions for a little while. I am in the middle of helping my mom move, trying to clean out my own place and various other projects. 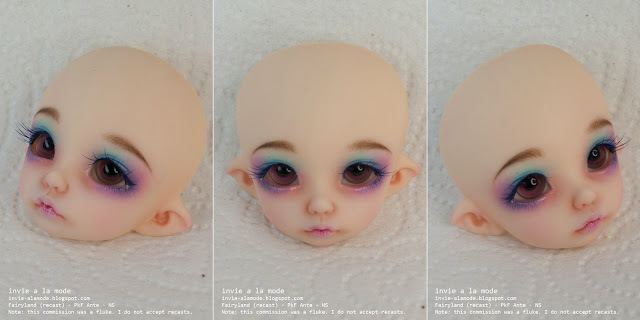 I will still be doing faceups but mostly on 1/6 scale dolls I need to return to clients and dolls that need to be rehomed since I usually purchase them blank and most ppl prefer theirs with a faceup. When the shop reopens I will be offering a lottery slot for more affordable dolls every two months. If anyone is interested in my work but cannot afford it for whatever reason this will allow you to customize your doll more affordably. Circus Kane releases very unique dolls. 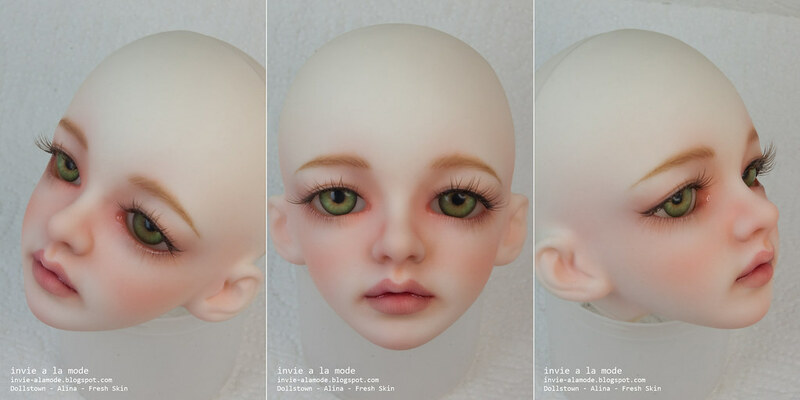 I know that there are those in the BJD hobby who dislike her aesthetic but I find it very refreshing and charismatic. I am usually attracted to awkward/ugly cute (but I hated troll dolls) so I was excited to have my usual customer Jo send me her Nexeven. My initial reaction upon receiving her was that she's very tiny and delicate. She is on the small side for MSDs at 38cm but even then she has such thin limbs that she seems even smaller. Her resin appears to be French Resin since it has a translucent quality. The finish is smooth but not shiny. Sculpt wise she has subtle musculature and very detailed ears. Her face is tiny but her eyes are HUGE so she looks like a little fae creature. 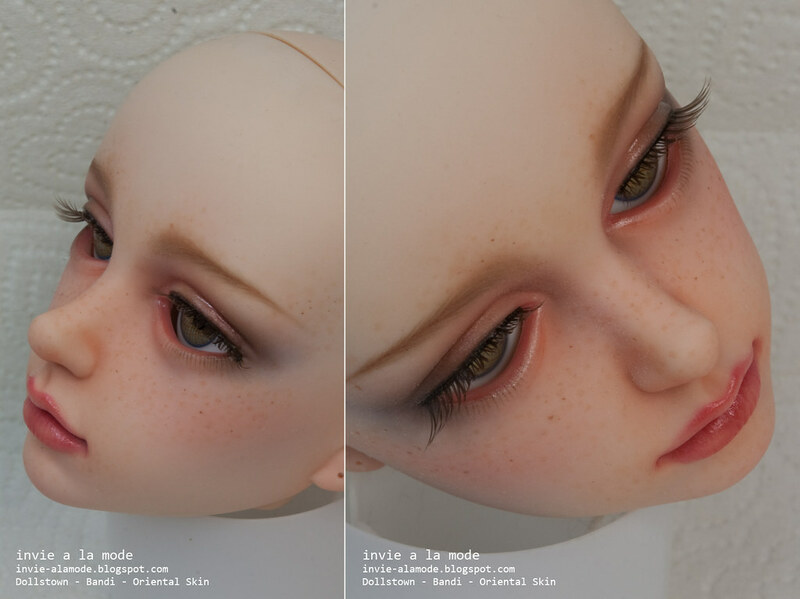 The request was for a sweet young faceup with gold on her eyelids and a tattoo of the Chinese character for the word 'love' on her face with part of it extending to become her eyebrows. The main color scheme would be gold with the aqua of Nexeven's shoes. Jo suggested that perhaps there might be gold dots, yin yangs and etc on her hands and feet or perhaps some other Chinese characters for 'strength' or 'peace'. The other specification she made was that the eyelashes on her upper lid be dark and that they be pointing downwards instead of up. I think this last request was because Nexeven's eyes are just so large already that if her lashes pointed out her eyes would look even larger! The sculpts I've been commissioned to paint are two SD sculpts (Estella and Bandi) and one MSD sculpt. 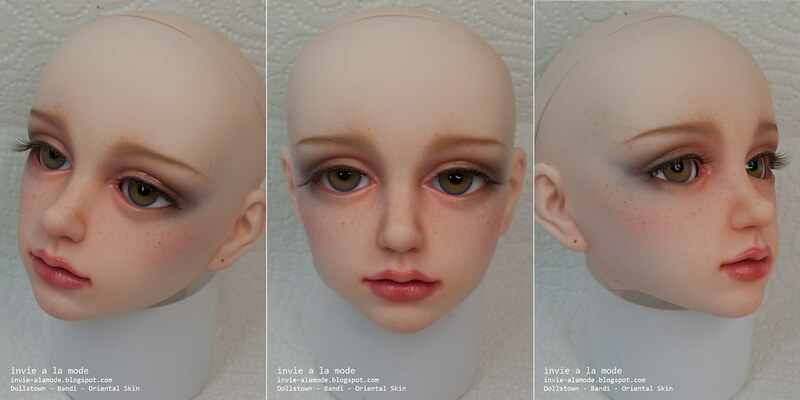 (Alina) The quality of the sculpting and casting is very smooth as to be expected from Dollshe. You can see on the Dollstown website that they spend a lot of time smoothing out the sculpt before casting. There are no unexpected rough spots where paint, brushes or pastels can catch so painting these are a wonderful experience. The first thing to notice about the sculpts is that the two SD sculpts show a bit more bone structure and detail than the MSD sculpt. I think that might be due to the difference in sculpting styles of the two sculptors than the size because I've seen MSD sculpts from Dollstown that look very similar to Estella and Bandi. I would be interested to see other Dollstown sculpts to do more comparisons. First up I have Alina. She's cast in what I think is pale skin since it is quite a bit paler than the fresh skin I've seen. The color is a beautiful warm white, not a paper white but not ivory. The sculpt is clearly hand sculpted since overall it is asymmetrical. It doesn't bother me since ppl are assymmetrical (myself included) but I know this is something that does bother some collectors. The style falls between anime and realistic since the eyes are large but the nose and facial structure is quite realistic. Experience wise, this commission was challenging because the buyer paid for the commission but disappeared for six months ignoring multiple attempts to contact her via etsy and private e-mails. Thus far I have still not confirmed that I should send her back and she has not paid for the lashes I attached. Still, I think the doll is beautiful and it's nice to look at her until the owner contacts me. The next Dollstown sculpt is SD sized Bandi. She is cast in Oriental skin and at first glance she is very similar to the Dollstown Estella I painted a month before. The immediate difference is that Estella is an open mouthed doll with teeth parts. On closer inspection there are clear differences in the sculpts with a little more definition in Bandi's chin, a wider nose bridge and heavier eyelids. Overall the subtle differences has me preferring Bandi more although I think Estella's teeth parts are incredible. Here are photos of both so you can compare. The request for Estella was for a Victorian boy. 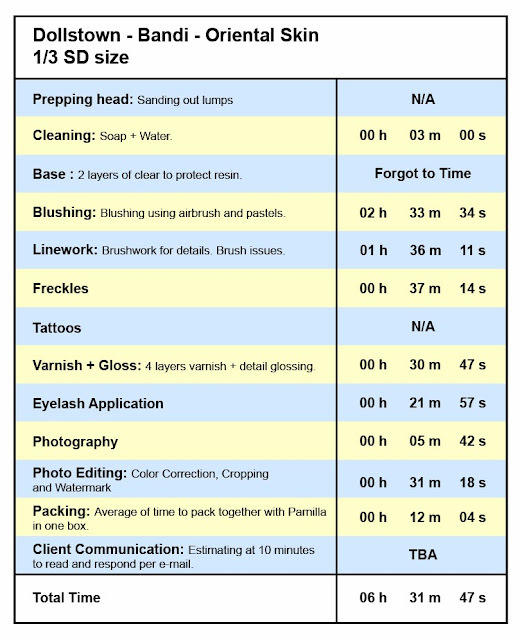 I wasn't sure about the age since this is an SD doll but the description seemed to be for a fairly young adolescent boy. I kept the look very natural but with a bit of sickly blue shadowing under the eye to give him a touch of fragility. 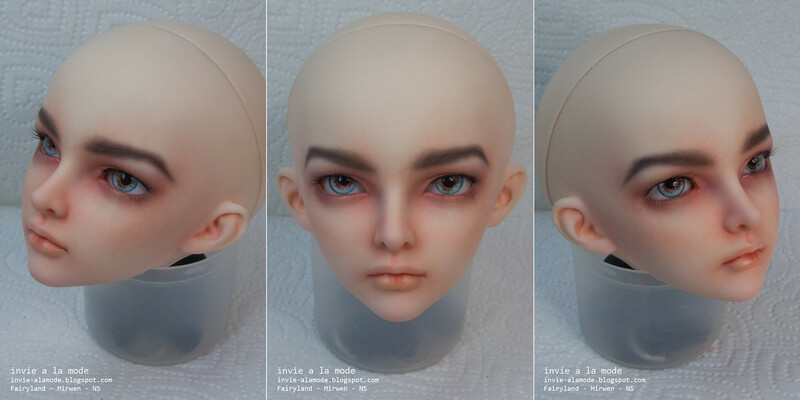 The colors are quite warm for this head since the base was already a warm tone. I really love how he turned out and the teeth parts were exceptionally easy to paint since the warm ivory resin was already very realistic. For Bandi the request was simply for freckles. Considering that this is an SD sized doll, I usually associate this size with adult dolls. Since the request was for freckles I kept her looking natural as well but added a bit of brown/grey eyeshadow with a touch of pink pearl. I left the lips looking bare but naturally flushed. Overall I really like the effect of freckles and in the future will consider adding a slight skin texture as an option for realistic faceups. Here are the time charts for Alina and Bandi. I painted Estella before I started timing my faceups so I don't have a chart for him. Here are a few more shots so you can see Estella's teeth parts a little more clearly as well as some close ups of Bandi. I hope everyone still enjoys these reviews. 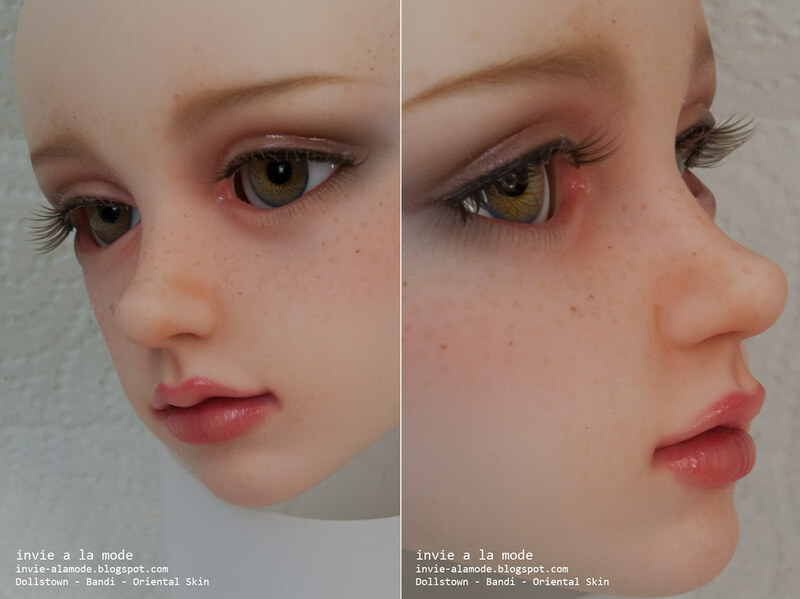 I find that my interest in BJDs tends toward the more technical and analytical side which isn't exactly everyone's cup of tea. If anyone has suggestions for a way to make my posts more interesting to them please let me know! I will work on more basic how to posts so that I can help those who are just starting out. 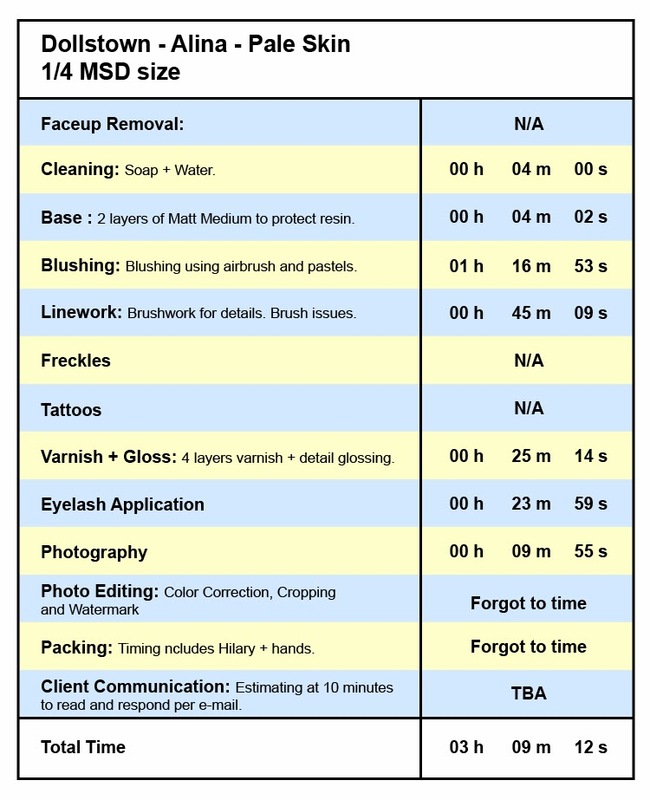 EDIT: I have removed information that may allow anyone to make a search for the client mentioned in this post. I realize I'm not used to writing posts about other ppl so I made a few mistakes by thinking that as long as I did not mention my client's name and contact info I was protecting their identity. As such I apologize if my writing is a bit awkward in censoring any relevant information. So if any of you follow my tumblr or twitter you will know that I was recently sent a recast to paint. Please note that I clearly state I do not accept or paint recasts and I am very much anti-recast. However the girl who sent the recast PukiFee Ante plate to me did not know what recasts were and as a recast commission showed up on my doorstep. At first I did not want to post any photos of this plate anywhere but then I realized it would be a good way to show ppl some signs to look out for in recasts. Here's my experience with the recast plate and how I discovered it was a recast. The first thought that crossed my mind upon opening the package was that the plate seemed oddly dark for Fairyland Normal. However since resin can change color with age I just soaked the plate in soapy water and gave it a scrub. While airbrushing on the base layer I noticed that one of the ears was a funny shape. Upon closer inspection I saw that there was a bit missing from the tip due to bubbles but it isn't super visible with a wig on. I contacted the owner to let her know. At this point I didn't think it was a recast but I was a little suspicious because I own a lot (yes a lot) of FL dolls and I had yet to see a bubble in any of their casts. I continued the faceup since I didn't have any proof that the doll was a recast. As I was painting her lips I realized that they were very poorly casted. They were the worse casting job I had ever seen. It was obvious that the mold was overused resulting in a loss of detail and overly wavy edges. Fine detail in lip lines require a thin fragile piece of silicone in the mold to give it that shape. Thin silicone can warp and stretch more quickly and as a result you end up with oddly wavy lip lines that no longer look like liplines. 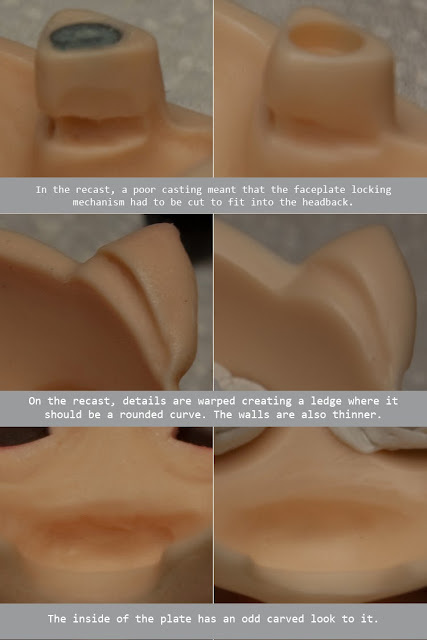 I tried to go on with the faceup because I didn't want to accuse anyone of sending me a recast but the issue with the lips bothered me so much that I looked at the back of the plate and compared it to all my PukiFee faceplates. Needless to say I only saw more evidence that the plate was a recast at which point I contacted the owner to let her know the casting issues and to inform her that if she purchased the doll from FL recently she should inform them of the poor job they did and if she got it second hand, it might very well be a recast. 1. Bubbles in the cast. 2. Odd resin color that is darker but not yellowed. 3. Terrible casting in the lips. 4. 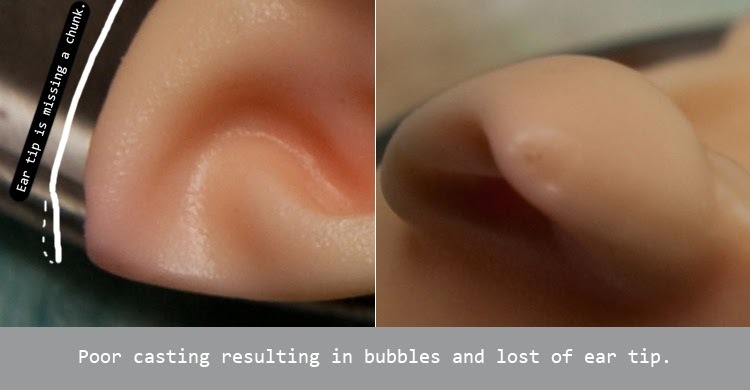 Loss of detail/odd bumps in the ears. 6. Very messy texture on the inside of plate. The owner got back to me and told me finally that it was a recast and she hadn't known about them when she bought her doll. She just thought she got a good deal and she felt very bad about it. I reassured her that since I was quite far along in the painting proccess that I would finish it and it was a mistake but she should enjoy the doll anyway. Here are some photos I took to show the difference between a recast and a legit. Pls note that the texture on the recast is because I was in the middle of painting it and so there is paint on it. You can see here that there are odd bits in the crevices from the bad casting. and the lip no longer looks like a lip much. From photos it is indeed difficult to tell it is a recast. 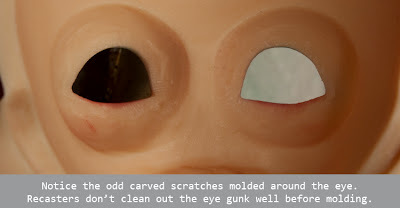 The details are very small so a lot of pro-recast ppl like to gloat that their dolls look just like the real thing. It's true that in photos it is hard to tell but in real life if you are familiar with the company there are issues that pop up. Keep in mind this is only a faceplate. I'm not sure how the body is or if its posing abilities are affected. 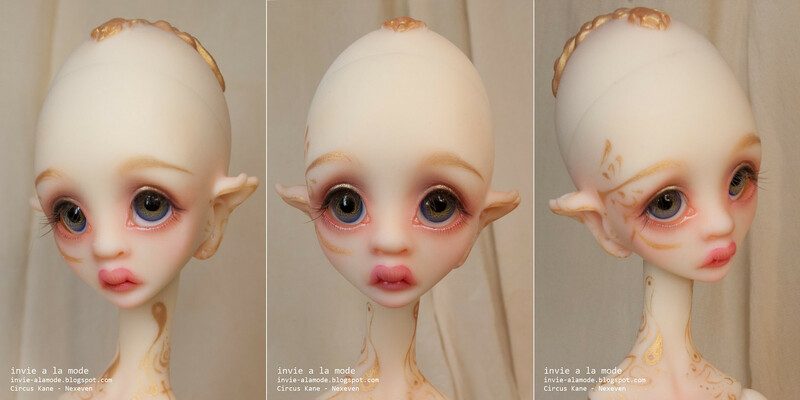 Since the commission ended, the owner has let me know she purchased a Pukisha straight from Fairyland and will be sending it to me to paint. I accepted this new commission a month or more ago but have since finally taken a look at my Facebook. I pretty much ignore Facebook but as a fluke I checked and saw the owner had friended me. Randomly I get a friend suggestion for a with person with the same name as a well known recaster. The icon photo was of some blonde man so I check his page to be sure it's him. It is indeed and it really sickened me to see that he had already appropriated new sculpts from companies and was recasting them with a colorist he hired to achieve resin colors closer to legitimate resin. Now why does this pertain at all to this recast commission? Because right there I saw that my customer had left a note on the page asking the recaster to get back to her on her new order. It left a sick feeling in my stomach so I went to check her page and noticed she had photos of various recasts including a Kinoko Juice and an oddly colored Pukisha. 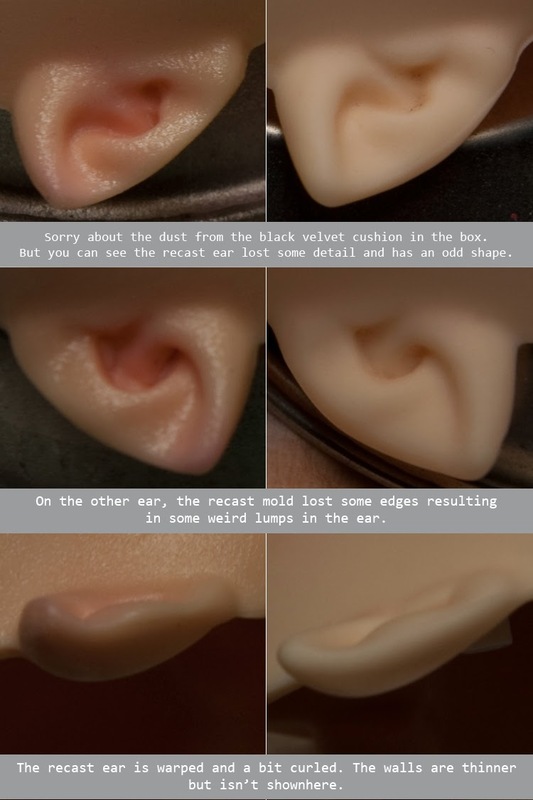 Not only did I notice she only had photos of recasts that belonged to her but I notice she recently took a trip to Disney Japan....now if you have money to go on a trip to Disney Japan, why don't you pay the rightful artists for their work? I would love to go to Disney Japan but I cannot afford it. Needless to say I'm quite suspicious of the incoming Pukisha and I am very very unhappy about the situation. So two years after my father passed away my family has finally signed for the house sale and my mother will be moving out. We've been having a massive cleanup in preparation and as a result I am also having a massive cleanup / cleanout. 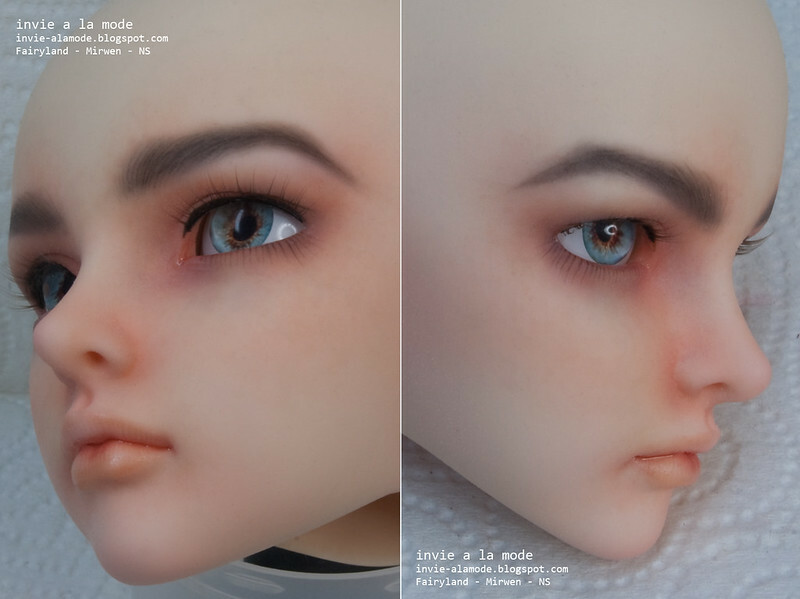 When I first got into BJDs I formed the bad habit of buying dolls to learn how to paint different sculpts. Of course the result is that I have a lot of dolls still in their boxes and not enough time to paint them or pay attention to the dolls I have named and painted and partially dressed. I figure it's time to outgrow this habit so I will be posting up information on the dolls I am letting go. While I have had some of these dolls for a year or more they have all stayed in their boxes so I am selling them as if they are new. There is little to no yellowing since they have been kept in a very cool dark environment. If there is no interest in them blank I will start painting them before I put them up for auction. Of course I have to figure out how much time I have so this might not happen for another month. Here is the first batch. They are all WS. All the Fairyland dolls come with their boxes and manuals. Spiritdoll Blanc comes with her carrying case. Please request proof photos only if you're serious. Prices do not include shipping. I ship from New York, USA. I will calculate shipping for your location and choice of shipping method. I prefer to ship Priority with Tracking, Signature Confirmation and Insurance. I know this sounds overdone but I prefer not to lose a doll. Of course the shipping method in the end is up to the new owner. Note: The LTFs will not come with modded painted sleep plates if they are bought blank. They will come with unmodded blank sleep plates. I accept Paypal and Personal checks. 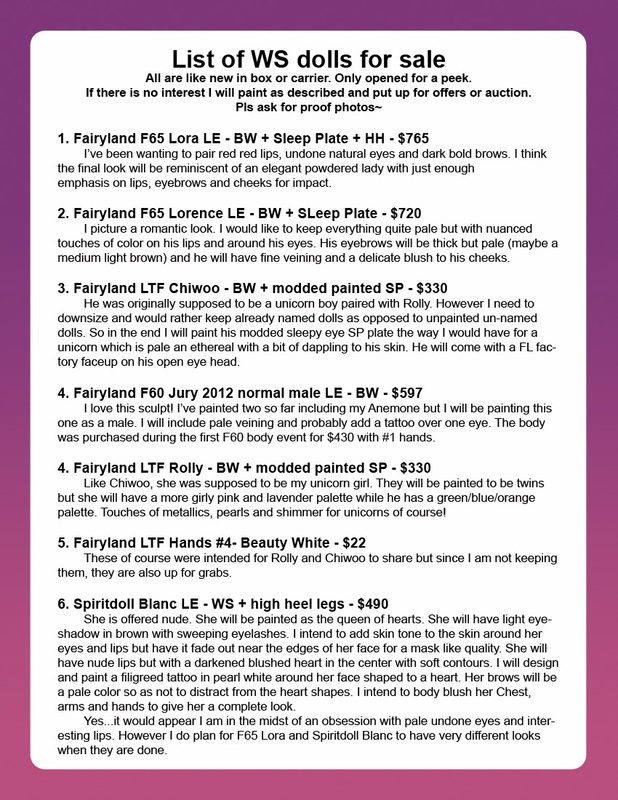 However I will not mail out your doll until after the check is cashed so if you want a quick arrival, PP is best. Yes, I can take commissions to paint the dolls on offer if purchased blank. Here are two girls I had as guests not too long ago. Ashbet's Bimong Narae 402, Amande. See more of her beautiful dolls and photos on her flickr! Talking and laughing! She's so cute. Born and raised in NYC I discovered anime in my early adolescence and have been a fan since. I've always loved making things and was immediately drawn to garage kits. I started making my own sculpts at 15 but I haven't decided to approach it seriously until recently. I hope to be able to offer a few original garage kits sculpted and cast by me sometime in April and original dolls in the Fall or Winter. 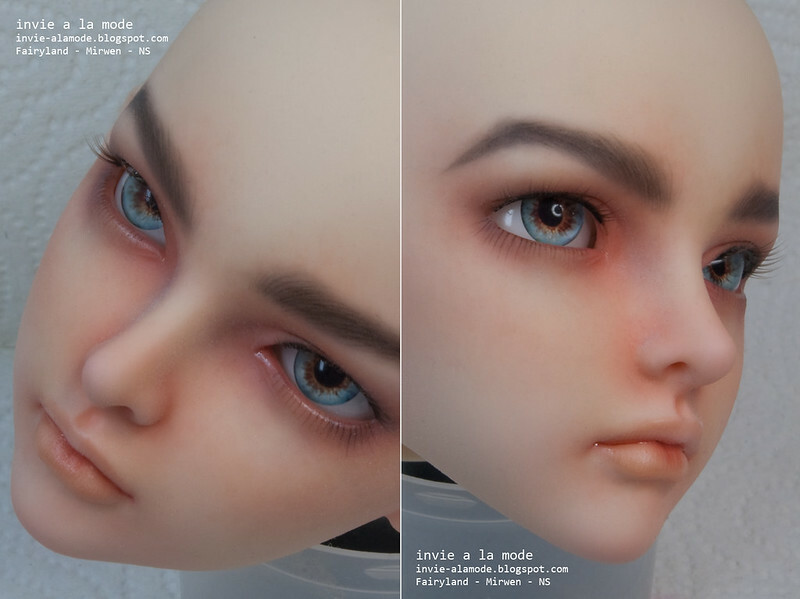 Right now I'm working getting better at doing faceups and I am accepting commissions for faceups so please check out my commissions page for 1/6 figures and BJD faceups.